Cast brass path/area light with black finish available with LED bulbs. Popular, organic shape that compliments any landscape. 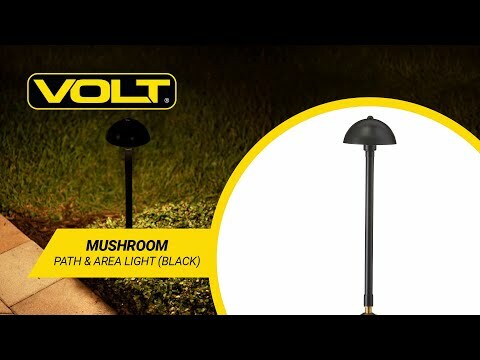 The VOLT® Mushroom Area Light is an attractive pro-grade low voltage outdoor light. Featuring a 24" stem, optional color matching extension rods. Perfect for area lighting and path lighting alike. Best for use on walkways and flower beds. The solid brass construction, premium grade internal components, and lifetime warranty ensure that this fixture is designed with longevity in mind. Dimensions Entire Fixture: 25" x 6" Stake: 10" x 3"